For the brightness, contrast, and color accuracy tests, we depend on a hardware colorimeter and software to help calibrate the displays. 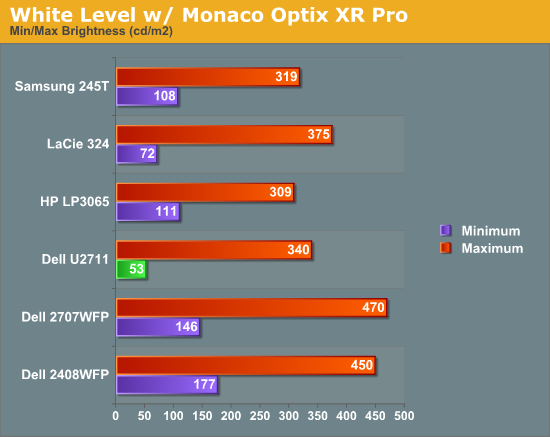 We use a Monaco Optix XR (DTP-94) colorimeter and Monaco Optix XR Pro software. Dell advertises a typical contrast ratio of 1000:1 and a maximum contrast (using dynamic backlight adjustment) of 80000:1. We're not interested in dynamic contrast, so we used the Adobe RGB setting for the results below. For those that are wondering, the reason we don't like dynamic contrast is that CCFL backlights take time to settle in and provide a consistent output, and if a display is constantly modifying the backlight level you won't get accurate colors. Don't pay too much attention to the white/black graphs, as they are merely reference points for how the displays perform at certain settings. Like many other LCDs, the U2711 has a "normal" brightness level of around 260nits (the Adobe RBS setting defaults to 50% brightness and contrast), which is more than sufficient and is actually brighter than what most users prefer to use in an office environment. You can reach the advertised 350nits (give or take) if you max out brightness and contrast. 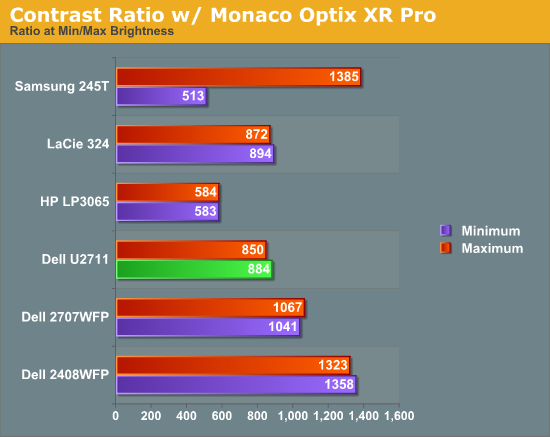 We're more interested in the contrast ratio, and here we find that the U2711 doesn't quite reach the advertised 1000:1 but instead comes closer to 850:1. We would have liked to see black levels a bit lower to improve the contrast, but really anywhere above 750:1 is difficult to see the difference, and 500:1 is sufficient for most users. At lower brightness settings, the contrast ratio improves to the point where our 100nits "print" result (~13% brightness) actually reached the advertised 1000:1 contrast ratio. 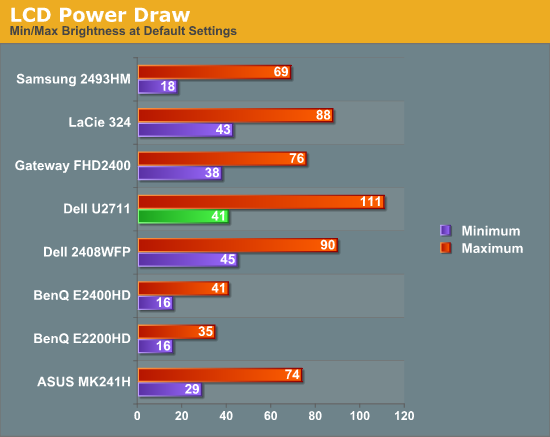 Going along with the brightness levels, here are the power requirements we measured at the Windows desktop using the minimum brightness (53nits) setting along with 100nits (13%), 200nits (36%), and maximum brightness (340nits). This is another area where we think the U2711 could be improved, but the cost might be too high right now. CCFL backlighting has been the norm since LCDs first came out, and it works but it's not the most power efficient way of lighting up an LCD. LEDs are the new and improved method, but while they can save power they also tend to deliver a lower color gamut. 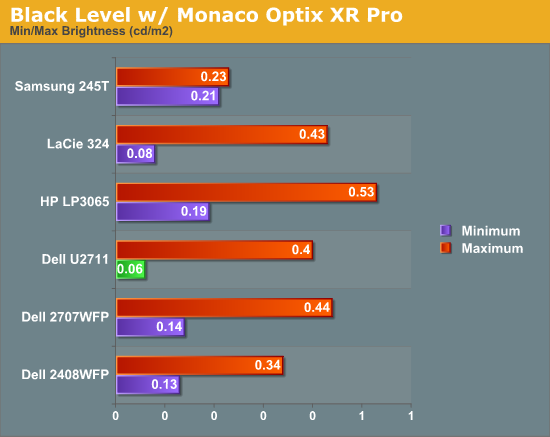 RGB LEDs address that shortcoming but they cost more and appear to use a similar amount of power compared to CCFL (and we've only seen them used in laptops so far). The U2711 draws a minimum of 41W, but a more realistic setting of 200nits will pull 72W. At maximum brightness the display settles down to 111W, but we measured a peak draw of 124W. (When we first cranked up brightness from 36% to 100%, brightness also reached 390nits before declining to 340nits.) We'd like to see LCDs that deliver all the color quality at half the power draw, but right now it's more a question of priorities: if you go green on power, your green colors may end up lacking. And to keep things in perspective, 72W at 200nits for a 27" LCD is still about half the power of your typical 21/22" CRT running at ~200nits!